products across different users base on the value your product offered. Viral marketing if carryout in the right way can grow your startup exponential without spending huge expenses on marketing campaign. A user that is been expose to your products. User expose to your product tells his friends and others potentials users about your products as a results of the value he got from it. Those potentials users are expose to your products and eventually turns them to your users and continue spreading the word of your products. This viral loop continue non stop, but the one important thing to know is that your products must be given some value that is enough for your users to willingly share about your products with others. The process begins with the new user coming in contacts with your products and it is repeated again and again. different company have different ways in which they strategy their viral marketing. 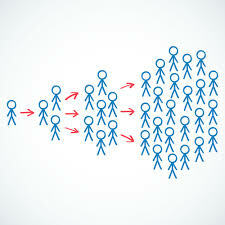 There are so many other forms of virality, but we are going to discuss the listed once above. When your products provide remarkable value, people will naturally share and tell others about it, so it is your duty to ensure that your products provides exceptional values that allow it to grow exponentially, an example is with Facebook in the early days because of the value it is adding to among the college students, it gain exponential growth through pure word of mouth. This form of virality works in such way that two users have to use the products in order to get the maximum value out of it. take an instance with whatsApp, you cannot send a message to your friends if he does not have the whats App install on his device, the are so many apps that utilise this strategy. In this case the product is still valuable on it own, but becomes more valuable when two or more people collaborate and the use the product, the viral loops takes can time to spread but once it 's users start achieving the maximum value through collaboration with other users, then the product will grow exponentially non stop. Start up can incentive their users to move up the viral loop and spread the news bout your product to others, pay pal use these in it early days. Must read:Technology Startup: 3 Amazing things you should be doing in the early days. Did you remember those snippet code from you tube and sound cloud that you copy and place them on your website or blog, now that is the form of viral marketing am talking bout here. facebook and twitter all use these form with their share button and tweet bottom. You can make your product with these feature that allows users to share your product features easily. Have you ever use a service and it ask you weather you could like to share what you are doing with your social media account. there are time when you see your friend playing a song spotify or sound cloud on your timeline, now that is what i call the social media form of virality, you can make your products in such a way that your users can share about what the are doing with your product on the social media account. forget to share with your friends on the social media using the social icons below.